The book is a collection of contributions devoted to analytical, numerical and experimental techniques of dynamical systems, presented at the international conference "Dynamical Systems: Theory and Applications," held in Lodz, Poland on December 7-10, 2015. The studies give deep insight into new perspectives in analysis, simulation, and optimization of dynamical systems, emphasizing directions for future research. Broadly outlined topics covered include: bifurcation and chaos in dynamical systems, asymptotic methods in nonlinear dynamics, dynamics in life sciences and bioengineering, original numerical methods of vibration analysis, control in dynamical systems, stability of dynamical systems, vibrations of lumped and continuous systems, non-smooth systems, engineering systems and differential equations, mathematical approaches to dynamical systems, and mechatronics. Illustrations note 176 Tables, color; 191 Illustrations, color; 101 Illustrations, black and white; XIV, 446 p. 292 illus., 191 illus. in color. 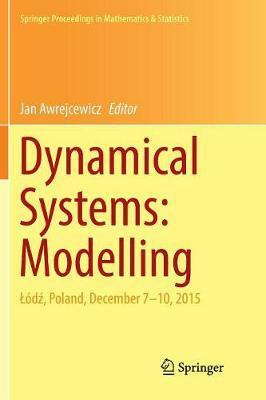 The book is a collection of contributions devoted to analytical, numerical and experimental techniques of dynamical systems, presented at the international conference "Dynamical Systems: Theory and Applications," held in Lódź, Poland on December 7-10, 2015. The studies give deep insight into new perspectives in analysis, simulation, and optimization of dynamical systems, emphasizing directions for future research. Broadly outlined topics covered include: bifurcation and chaos in dynamical systems, asymptotic methods in nonlinear dynamics, dynamics in life sciences and bioengineering, original numerical methods of vibration analysis, control in dynamical systems, stability of dynamical systems, vibrations of lumped and continuous sytems, non-smooth systems, engineering systems and differential equations, mathematical approaches to dynamical systems, and mechatronics. On dynamic behaviour of a nonideal torsional machine suspension structure (G. F. Alisverisci, H. Bayiroglu, J. M. Balthazar, J. L. P. Felix, R. M. L. R. da Fonseca Brasil).- Structural probabilistic modeling of fatigue fracture for piezoceramic materials under cyclic loading (D. Babich and O. Bezverkhyi and T. Dorodnykh).- Numerical analysis of child restraint system equipped with built-in belts pretensioner during frontal impact (P. Baranowski, J. Bukala, K. Damaziak, J. Malachowski, L. Mazurkiewicz, M. Artur).- Analysis of the dynamic behavior of a radar tower (R. Barros, H. Guimaraes, M. B. Cesar).- Determination of the fatigue life on the basis of fatigue test and FEM for MCMgY4RE3Zr with rare earth elements (H. Bakowski, J. Adamiec).- Mathematical Modelling Of Forward Fall On Outstretched Hands As a -DOF System With Contact Of The Floor (P. Biesiacki, J. Mrozowski, D. Grzelczyk, and J. Awrejcewicz).- Micelle confined in aqueous environment: Lubrication at the nanoscale and its nonlinear characteristics (P. Beldowski, R. G. Winkler, W. K. Aug'e II, J. Hladyszowski and A. Gadomski).- The sensitivity analysis of the method for identification of bearing dynamic coefficients (L. Brenkacz and G. Zywica).- Investigations of Composite panels Mounted in the Cargo Space of a Freight Wagon (A. Buchacz, A. Baier, K. Herbus, M. Majzner, P. Ociepka).- Project of laboratory stand, and preliminary studies of vibration shell freight wagon (A. Buchacz, A. Wrobel, Marek Placzek).- Analysis of dynamical response of the freight wagon (A. Buchacz, M. Placzek, A. Wrobel).- Evolutionary model for synthetic spectrum compatible accelerograms (F. Carli, C. Carino).- A Parametric Study of Mixing in a Granular Flow a Bi-Axial Spherical Tumbler (I. C. Christov, R. M. Lueptow, J. M. Ottino and R. Sturman).- cal model for robot-indenter (M. Dosaev, Y. Okunev, R.-C. Luo, V. Samsonov, O. Vasiukova).- A Docking Maneuver Scenario of a Servicing Satellite - Quaternion Based Dynamics and Control Design (E. Jarzebowska, M. Szwajewski).- Non-linear dynamics of a vibration harvest-absorber system. Experimental study (K. Kecik, A. Mitura).- Three chamber model of human vascular system for explanation the quasi-regular and chaotic dynamics of the blood pressure and flow oscillations (N. Kizilova).- Maximization of average velocity of vibratory robot (with one restriction on acceleration) (M. Kulikovskaya, V. Samsonov).- Asymptotic Solution of the Problem to a Convective Diffusion Equation With a Chemical Reaction Around a Cylinder (R. G. Akhmetov, N. V. Maksimova).- Assessment of Eigenfrequencies of the Middle Ear Oscillating System: Effect of the Cartilage Transplant (G. Mikhasev, S. Bosiakov, L. Petrova, M. Maisyuk, K. Yurkevich).- The method of modelling human skeleton's multi-body system (T. Miroslaw).- Fragility estimation and comparison using IDA and simplified macro-modeling of in-plane shear in old masonry walls (E. C. Morais, L. G. Vigh, J. Krahling).- Analytical model of dynamic behavior of fatigue test stand - description and experimental validation (R. Owsinski, A. Nieslony).- Assessment of Modal Parameters of a Building Structure Model (P. Palenica, B. Powalka, R. Grzejda).- Simplified model of city bus dynamics as a tool of an energy consumption estimation (T. Palczynski).- Modeling of buildings behavior under blast load (J. Siwinski, A. Stolarski).- Force effect of strike and the possibility of causing a skull fracture of a human head (S. Martin, S. Josef, J. Karel, K. Petr).- Hydraulically driven unit converting rotational motion into linear one (G. Szymkiewicz, O. Szymanowska, D. Lewandowski, D. Grzelczyk, J. Awrejcewicz).- The recognition of human by the dynamic determinants of the gait with use of ANN (T. Walczak, J. K. Grabski, M. Grajewska, M. Michalowska).- Optimization of micro-jet dynamical systems cooling after steel welding (T. Wegrzyn, J. Piwnik, A. Borek, W. Tarasiuk).- Modelling of thermoelectric processes in FEM environment based on experimental studies (M. Wikary, S. Radkowski, J. Dybala, K. Lubikowski).- The modeling of nonlinear rotational vibration in periodic medium with infinite number of degrees of freedom (A. Wirowski, P. Szczerba).- Numerical model of femur part (W. Wojnicz, H. Olszewski, K. Lipinski, E. Wittbrodt).- FEA-based design of experiment for the damping determination of thermoplastic-rubber Compounds (M. Wuehrl, M. Klaerner, L. Kroll).